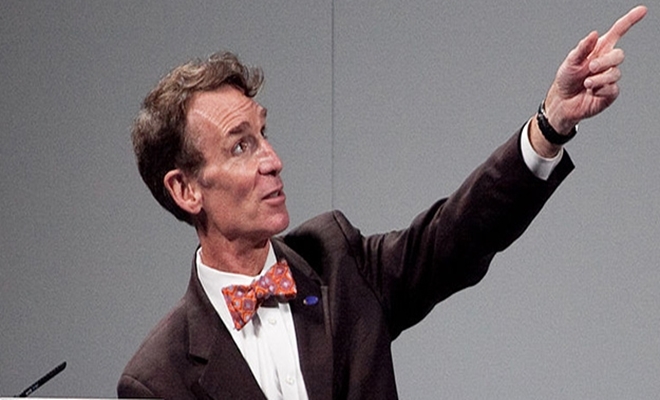 HomeENVIRONMENTPro-Monsanto Bill Nye the ‘science guy’ says GMOs are awesome and climate change skeptics should be thrown in prison… yeah, really! Pro-Monsanto Bill Nye the ‘science guy’ says GMOs are awesome and climate change skeptics should be thrown in prison… yeah, really! Celebrity scientists such as Neil deGrasse Tyson, Michio Kaku and Bill Nye keep their careers afloat by embracing mainstream scientific theories and presenting them to the public in a reassuring show-biz manner – and not by applying any real criticalal thought themselves. You don’t get invited to appear in the mainstream media on a regular basis by questioning the status quo or being skeptical about Big Pharma, the biotech industry orvaccine safety, for example. And you certainly won’t be featured on network news or talk shows if you dare to question the climate change agenda. Bill Nye, the “science guy,” has become little more than a shill for the GMO industry and a cheerleader for the global warming carbon-trading scheme, among other agendas (such as eugenics and depopulation). It seems that remaining in the limelight is more important to Nye than remaining true to some of his earlier, more sensible opinions on issues such as GMOs. For years, Bill Nye expressed skepticism regarding the safety of GM agriculture and its possible negative effects on ecosystems. He made reasonable and valid observations in an Eyes of Nye video from 2013, in which he called for GMO labeling and outlined an imaginary scenario in which GMO farming caused an imbalance in an ecosystem. “Let’s farm responsibly, require labels on our foods and let’s carefully test these foods case by case,” he concluded. But in 2015, Nye suddenly changed his opinions on GMOs. He met with Monsanto representatives and somehow walked away a believer. He has now become a rabid devotee of GMO agriculture and wants to tell the world about it. Aside from both of those statements being blatantly false, it’s hard to believe these words are coming from the same person who made the above-quoted statements about responsible farming just two years prior. “In the case of herbicides, Nye is simply incorrect, and it’s an important error to point out. “GMO herbicide-resistant crops are made to withstand the spraying of herbicides, primarily glyphosate (or Roundup), in quantities that would otherwise kill them. GMO Bt crops, on the other hand, are engineered to produce an insecticidal toxin within the plant. Rather than decreasing toxic pesticides in streams, the former products contribute to their presence. Glyphosate is now widely detected in our country’s water, according to government scientists. And recently, a major, independent body of scientists determined that glyphosate is probably carcinogenic, raising the stakes. Prison for climate change skeptics? As if this weren’t enough evidence that Nye has now “gone to the dark side,” consider his recent statements defending the assertion that “climate change deniers” should be imprisoned. “Was it appropriate to jail the guys from ENRON? Was it appropriate to jail people from the cigarette industry who insisted that this addictive product was not addictive and so on? And you think about in these cases — for me as a taxpayer and voter — the introduction of this extreme doubt about climate change is affecting my quality of life as a public citizen.